Is there an option to sync Tresorit on a NAS? Why use Tresorit instead of secure FTP? 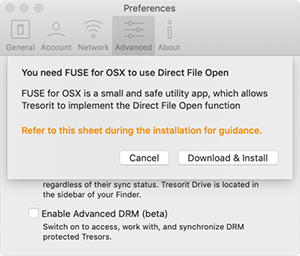 After installing FUSE on your Mac, you will be able to access useful Tresorit features like Direct File Open and Tresorit Drive. With FUSE, we can connect your Tresorit files to your Finder, enabling a direct access to the data you store in the cloud. You need Admin rights to install and update FUSE. Check Enable Direct Files Open (beta). Click Download & Install on the notification window. Wait for FUSE to download. Enter the computer's admin username and password. Click OK and wait for FUSE to finish installation. Click Open System Preferences on the notification window. Click the lock on the bottom to make changes. If you experience issues with Tresorit Drive on your Mac (for example if you can’t upload or access files), you may need to update FUSE to solve the problem.